The Chicory is a wonderful New Orleans wedding venue with tons of great character, similar to The Foundry, a nearby venue that, much to the dismay of many wedding professionals in the city, shut down in 2014 after someone purchased the building to turn it into an auction house. But The Chicory is going strong, and is a much loved ceremony and reception space. 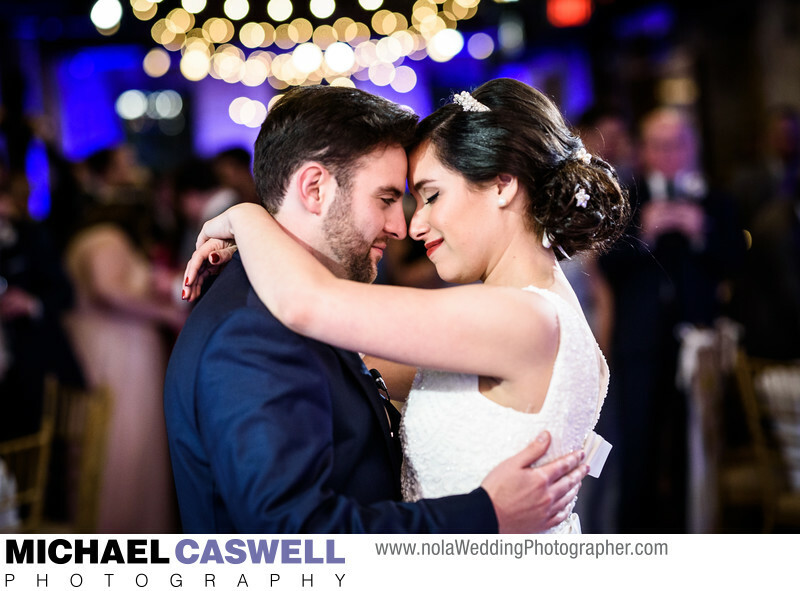 It features a great location right by the popular Fulton Street area, and is one of those great New Orleans wedding venues that has its own distinct look and ambiance that is instantly recognizable in photographs. This reception took place in the main part of The Chicory, the Fulton, Orleans, and Lafayette rooms (along with the balcony, overlooking Fulton Street). With lots of exposed brick and wood beams, this space has lots of character and photographs well, especially when adorned with, in addition to the beautiful floral decorations, gorgeous decorative lighting by Luminous Events. Entertainment for this wedding was over-the-top! The Chee Weez delivered a non-stop concert-like party atmosphere with a bunch of great '80s songs (many of which I'd never heard at a wedding reception before), along with lots of more current music as well, keeping the dance floor completely packed all night long. Toward the end of the event, several guest singers joined in with the band, including the bride's brother, and another guest who sounded almost exactly like AC/DC vocalist Brian Johnson. But the best guest musician of all was the groom himself who sat in on drums and surprised everyone with his impressive chops! The Chicory features several spaces for a ceremony, such as the Orleans room, where most of there ceremonies I've photographed at this venue have taken place. There are other spaces available as well, such as the Parlor room. Wedding receptions look absolutely gorgeous at The Chicory. The Orleans Room is the main space in the venue, where most of the reception action takes place, with the band or DJ being located at this end of the room. The opposite end of this room is frequently used for ceremonies, but this space be turned around by the staff to use for the reception as well. I adore this particular combination of romantically warm string lights with blue background lighting! Most weddings at The Chicory also utilize the Lafayette Room, which is directly adjacent to the Orleans Room. This space is perfect for people who want to take a break from the dance floor action and loud music to eat and have conversations. The large balcony overlooking the Fulton Street area is accessed through this room as well. Location: 610 S Peters St, New Orleans, LA 70130.